Happy with a smile makeover with his dentists in Cancun! You are here: Home / Blog / Cosmetic Dentistry / Happy with a smile makeover with his dentists in Cancun! The great thing about coming to Cancun for your smile makeover with crowns is that you can enjoy the best dental service and the most amazing vacations at the same time. We usually need a week to finish the look of your new teeth, and while you wait you can go to have fun around downtown, Mercado 28, the Hotel Zone, Isla Mujeres and more. Thousands of Americans have come to our clinic to get first class dental treatments with the most professional staff. They leave as friends. One of such patients is Henry who agreed to make a video testimonial review like many others we have. He got a smile makeover with crowns. Crowns are a type of dental restoration which, when cemented into place, fully cup over the portion of a tooth that lies at and above the gum line. My name is Henry, I’m from New Jersey, United States I have some crown done and I also have two implants and I am very happy with the cosmetic portion, the feel and the bite is very good, the feel is very natural and I would be able to eat good things that I’d want to eat before this treatment. I could not probably to eat steaks and now I can enjoy steak. All the staff, all the staff is excellent, and dentists that treatment me all extremely confident, extremely professional. I am very happy to have had the treatment. And the place is excellent compared to Unite States is much much better and surely if you combine trip to I have a good time for same price as you pay in United States. And I think I’m very safe in Cancun because I have a car that I can drive everywhere and there is no problem, the beach is beautiful, people friendly and just a very enjoyable place. If you want to know more about getting a smile makeover with crowns with our dentists in Cancun Cosmetic Dentistry can do for you call toll free from USA and Canada 1-800-565-1424, or if you are already on vacation in Cancun and want to meet us, you can call us for an appointment at the following local number (998) 1-40-51-25. "Get your teeth done here because there's no other place like this!" Discover the AMAZING hidden power of your smile! Prevent facial collapse and bone loss with dental implants! How much time I need for a smile makeover in Cancun Cosmetic Dentistry? What are teeth made of? How to get the best All-on-4 and smile again? Water flosser? This is the best way to clean your teeth and dental prosthetics! How to fix big gaps between your teeth? Patient happy to come back! Returning patient visits dentist in Cancun! How do eating disorders affect my teeth? Full mouth restoration with All-on-4 or All-on-6 dental implants? Amazing All-on-4 case at our dental clinic in Cancun! Inlays, onlays or ovelays? What’s the right one for you? A big change with All-on-4 dental implants in Cancun! 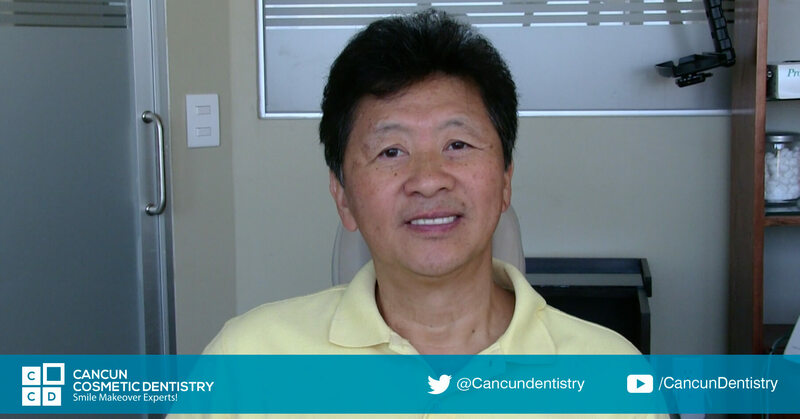 Testimonial from a long time patient of Cancun Cosmetic Dentistry! Celebrate New Year 2019 in Sunny Cancun! Take a break from the cold! Come for a Dental Vacation in Cancun! Dental implants or dental bridges for teeth in posterior area? Cancun Cosmetic Dentistry has warranty on their dental pieces! Dental Bridge vs Dental Implants? What’s best for you? What can you expect when coming to Cancun? Safety when traveling! What makes us different than other dental clinics? Our staff! A Cancun Cosmetic Dentistry video review from Casey, owner of a wolf sanctuary in Canada! Dental implants and crowns on your dental vacation in Cancun! Despite sensationalist media, Cancun remains the top vacation spot for Americans! We connect to other people with our smile. A must read testimonial!! This is what you can expect when getting All-on-4 dental implants in Cancun! Doctor German Arzate just got certified by the ABOI/ID! The best implant denture alternative is in Cancun! Get the best dental experience in Cancun Cosmetic Dentistry! Combining dental implants and cosmetic dentistry for better results! She loves coming to her dentist in Cancun! Is it a good idea to come to Cancun for dental tourism? Dental cordinators are available Mon-Sat 9:00 A.M. - 8:00 P.M.
- Call toll free from the USA or Canada at 1-800-565-1424. We open 6 days a week (Including Holidays). Walk In's welcome. A Cancun Cosmetic Dentistry video review from Casey, owner of a wolf sanctuary... What makes us different than other dental clinics? Our staff!